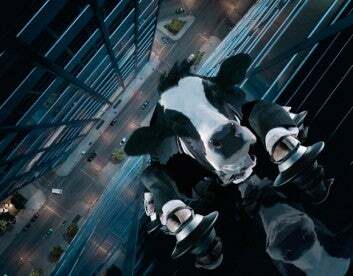 WDC: The images featured in The Secret Life of Cows were initially created for an advertising campaign for Chick-fil-A. Tell us about the background behind the creation of the images, and your inspiration for the characters. Glen: With all of my commissioned work, there is a primary obligation to fulfil the marketing needs of the client. The image in the beginning of the book – of the old farmer couple with a video camera documenting cows disembarking from a UFO – was an ad for Sony camcorders. The Secret Agent Cows and Superhero Cows that make up the two chapters of the book were commissioned for calendars to promote fast-food chicken sandwiches. The ad agency developed the long-standing campaign in which cows protect their species by advocating that people eat chicken instead of them. The marketing is very funny and successful, but my personal challenge and inspiration lies in transcending the commercial intent. In the end it’s all about the image: does it hold its own beyond the intent of the marketing? Stripped of the aspects of commerce do the images have relevance or significance as part of our art and culture? Tim Wride, who is the curator of photography at the Los Angeles County Museum of Art, wrote the introduction to the catalogue for my 2005 exhibition, 25:25. He discusses the breakdown of the barriers between commissioned photography and fine art photography. My original intent was to be a fine art photographer – however, commercial commissions, starting with album covers, allowed for the opportunity to make images that otherwise would have been financially out of reach. WDC: What have been the highlights of your career to date? Glen: The personal highlights are when a final image meets my artistic expectations. 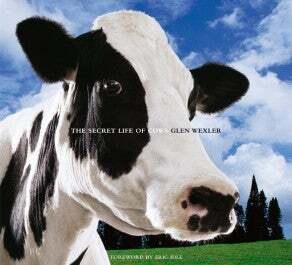 In terms of specific events or projects, the publication of my first book, The Secret Life of Cows, is certainly a highlight, as was my 25-year retrospective exhibition last year in Los Angeles. Working with Michael Jackson at the pinnacle of his career, and with Shaquille O’Neal and KISS, and jazz legends Herbie Hancock and Chick Corea has also been very memorable. Album covers for Van Halen, ZZ Top and Black Sabbath are also high on the list as is shooting a cover for Time magazine. One of my first big advertising assignments was working on the famous Maxell campaign. I am also honoured to be featured in prestigious magazines such as Communication Arts, French Photo, and Zoom, and to be awarded Editorial Photographer of the Year by the International Photography Awards. Glen recombines captured elements of the real world to create a fantastical vision. He starts by visualising the finished image, then breaks it down into manageable components to be individually photographed and, finally, digitally seaming it all together. All compositional elements, lighting, and perspective decisions are carefully considered before the shoot. In creating the images for his book The Secret Life of Cows, his production designer and collaborator of nearly 20 years, Anthony Tremblay, enlisted the services of Charles Rivera to sculpt a very realistic one-third-size miniature cow. Next, a mould was made of it, for the purpose of creating several foam castings that could be cut and individually reassembled in the pose desired for each cow character. The cow forms were then dressed. The Superhero costumes were styled and fabricated by Gayle Davis. The Secret Agents were styled by Lori ‘Tin’ Wornom, and the costumes fabricated by James Hayes, who creates wardrobe for the Muppets. Anthony created production drawings for each set and built them in miniature with a team of model makers. The sculpted cows were photographed in the miniature sets. It took 30 days each for principal set and element photography, followed by several days photographing the actual cows. With the help of a team of cow wranglers, the Hollywood cows were lit and shot in perspective to match their sculpted ‘body doubles’ in the set photography. Special effects were also shot. Then there were hundreds of elements to combine in Photoshop – nearly 600 hours for post-production image editing.